Venturing into grandma’s closet can be seen as a destination for marvel, where dress-up dreams come true. For designer Alejandra Alonso Rojas, her grandmother’s armoire shaped the DNA of her luxurious yet modern ready-to-wear brand. Rojas’ grandmother maintained a long-term mentality towards shopping, seeking out quality pieces from Balenciaga or having a seamstress to stitch custom items that would fill in holes in her edited wardrobe. And that’s exactly how Rojas approaches each collection she creates for the eponymous brand she started in 2016. She’s known for classic silhouettes that transcend trends and whipping up designs that can be passed down for generations to come. It’s an aesthetic that, when mixed with thoughtful and sustainable manufacturing practices, has set this Madrid-born designer apart in a crowded market. After all, it’s not often that you see gorgeous silk dresses with hand-painted prints alongside fiery red jackets with buttons that are emblazoned with the family crest of the designer. 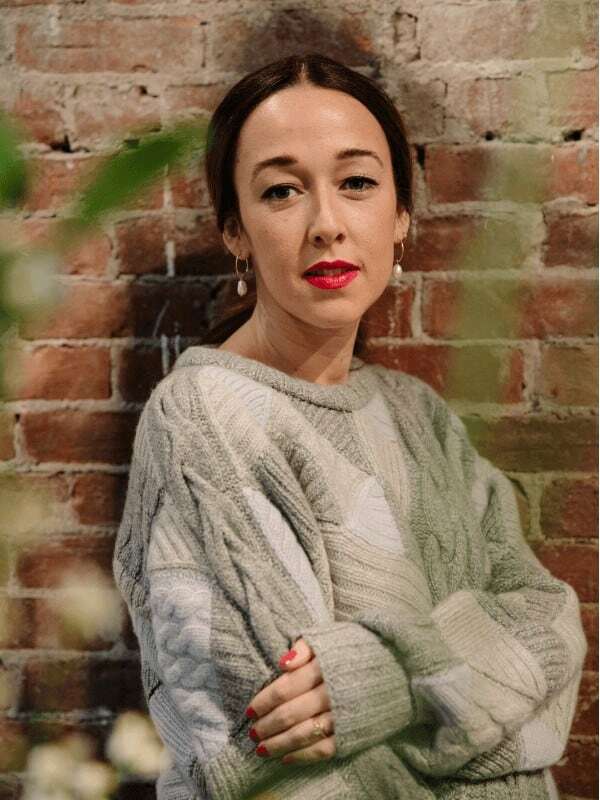 Rojas invited The Frontlash into her airy Tribeca pop-up just a week before the shop shuttered to talk about her green approach to pregnancy, her skill of refurbishing furniture and, of course, how she maintains a sustainable fashion brand that’s designed and produced in Manhattan. I'm originally from Madrid, Spain, and I started knitting when I was four. Design was always a part of me, like making things for dolls and sketching. By the time I was three or four, I wouldn't let my mom pick the clothes that I was wearing for school. Then, I started going through my mom’s and my grandma's closets. They both have amazing style and are a big part of my inspiration. I was always intrigued by construction and asking “How are the garments done?” I always wanted to alter seams or move things around. I started my degree in Spain when I started working with a master tailor and a couture designer, and a few other jobs for more corporate companies. The more I worked with smaller designers, the more I realized that I really wanted to have my own brand. I did my masters at the School of the Art Institute of Chicago because I wanted to push my boundaries in design. The way that I was trained in Europe was more—I don't want to say conservative—but it was more of the classical approach. When I moved to New York I spent time in the studios with Nicholas K and with Anna Sui, but at the same time I was doing my own thing, like a footwear collection that I was selling at a few stores. The story of her very first brand...and her second brand. I launched À Moi in February 2014. It was more experimental and more trend-driven than the line I have now. I had À Moi for two and a half years and it was doing well, but the market was a little bit saturated and I needed a pause to rethink what I was really inspired by. I took a break and went to Spain where I went through archives of images and pictures. When I first launched À Moi I wasn't ready to put my name on a brand but after I took that pause I realized the inspiration had always been there. It was my home, it was my heritage, my roots. So in 2016, I decided to launch my namesake brand, right here in New York. More on those family ties. Red is always a theme in my collections or there are at least little red details or red stitches. The color is like a wink to my grandma and my mom, who always wore red nail polish. My family crest is on the buttons and in the logo as well. My grandma was always obsessed with suits, and my dad was always wearing suits and going to his tailor, so that explains why I'm obsessed with tailoring. Even with À Moi we were never into mass production or mass market and, as a knitter, I was always very interested in developing our own fabrics and trying not to use a lot of factory processes. We actually paint each print that we do at the studio with watercolors. They're all custom-made. For me, it’s important that our sustainability is all about developing everything by hand and going back to artisan practices, rather than having machines everywhere. We've reduced the number of factories that we're working with so that everything is more curated. It's important for me to know where everything is manufactured and who my artisans are, so I spend tons of time with them in the Garment District. I would say 90 percent of the collection is produced in New York City. It allows me to keep an eye on waste because when you're shipping back and forth you need to do more samples and send more materials and buy more stuff. It's not just as a brand asking, “What are your practices?” It's also, where are you sourcing your material? All of our fur, leather and suede comes from the top tanneries in Italy with certifications from Institute of Quality Certification for the Leather Sector. When we order our leathers and shearlings it’s important to know where they’re coming from. Our tanneries use mainly bovine skins that are quantity controlled and monitored for natural characteristics, so the skin is environmentally friendly and renewable. Its transformation in the tannery characterizes the physical and mechanical properties of durability. The quality is so high that even when the skins are unaltered, they’re better quality than products made from similar materials. In terms of fabrics we use silks or natural materials, like viscose or wool, that allows natural dyes to take hold. For fall we actually started to use eco-cashmere for the first time, which is made with all recycled cashmere fibers. The gray sweater I'm wearing is done in this cashmere. For pre-fall I was really interested in trying natural dying, so we did some research and started doing a ton of sampling. We used turmeric, blackberries, cabbage, indigo and natural minerals. All of the silks with the degradation pattern have been dyed with that and we also did dyes with flowers and lots of practices with vinegar, steaming and freezing. The entire studio was working on the dye; it looked like a lab! We also love to reuse our excess fabrics, like using the beautiful colors of leather that we develop every season as striping, attaching them with a fur machine and creating a pattern. We could use all of our leather inventory doing gorgeous color combinations. I wouldn't say that my brand is 100 percent sustainable because I don't have the certifications for everything, but I think it’s really important to keep integrating new practices season after season. Tell us all about the pop-up. I wanted to see the collection in a new environment and have direct contact with people who might not have known about the brand yet. I looked for spaces for over five months because I wanted it to be downtown and I wanted a loft vibe to the store. We were super lucky to find this space and I just wanted to present the brand as a lifestyle brand, what it is, to show the collections existing together. And we hear you sustainably designed all the furniture here, too. As a hobby, my mom started restoring furniture and objects when we were living in Madrid. And over a year ago when I bought a house in Shelter Island I didn't want to furnish it want any new furniture because I wanted to find pieces that had a story. So I got into restoring and it has become a crazy project of mine. It's fun to nourish the wood and play with different fabrics. I started re-upholstering some sofas and moved on to items that I found all over the world. There's a bar from France, a sofa that came from Italy, I bought a bunch of stuff during a trip to Marrakech. And there are no paper shopping bags here! Paper is a sustainable material, but do I want to have 3 million paper bags in my house? No, because they just get folded and go in the recycling bin. I don't feel sustainable when I’m recycling paper bags. Our shopping bags are made of cotton because we want our customers to reuse things. For me that's a very big part of sustainability. It's not about mass produced items, but the items you just keep using over and over again. That sounds like your design ethos. I remember [my grandma] having a closet with some amazing pieces. But it was about buying into quality and having these gorgeous pieces for years. When the mass market came into play, it was almost like you had to own 800 closets to fit all the crap you were buying. You should buy less pieces that will last longer so you don't have to buy clothing constantly. I grew up with quality clothes in my closet, but not three million of them, so that was the idea I wanted to bring to the brand. Speaking of family influences, you’re about to bring a baby into the world. What’s changed in your life with your pregnancy? I had no idea that you had to change your [beauty] routines! When they told me I was like, “Oh my god!” and started looking into everything. I was really happy that all the products I use from Dr. Barbara Sturm, which is my go-to for skincare, was 100 percent safe for babies. I've also bought all of her baby skincare for when the little one is born. It's a doctor behind the brand, so I trust that. I was happy to hear that Tracie Martyn was all-natural, organic and that I could use it. What I tend to do now is wear less makeup than I used to. I'll usually just use Glow Drops and just put a little bit of Charlotte Tilbury mascara and Ilia lipstick and I'm good to go. For the hair, since I have very curly hair and I used tons of products, I did a bit of research and I found Rahua shampoos work really well. I find that coconut oil is the best, so I have a jar in the shower and I put it all over for extra hydration. I have the Dr. Barbara Sturm Anti-Aging Body Cream and I put Hatch Belly Oil all over the place, but I still, I don't know how, my skin feels dry! After all three layers! Apparently your skin gets really, really dry when you're pregnant. I read online about Agent Nateur’s deodorant, that it's all-natural and that it works. So I use that. With food I just cut out the things that they recommend cutting out, and I've been taking the Prenatal Vitamins from Honest, because everything is organic and natural. For the baby I've been researching and I'm going to buy the diapers and baby wipes from Honest. It's so easy to get rashes or allergies from the perfumes. Basically, everything I use now doesn't have perfumes, besides a few select makeup products. Other than that, everything is perfume-free because it dries your skin out, a lot. Let’s talk about prenatal self-care. “I've been getting facials from Dr. Barbara Sturm when she's in town. But since I have so many of her products at home I can do my own facials and I find it really relaxing, especially to do the exfoliation. The more appointments I have, the more anxious I get, so when I'm home at night I just enjoy doing all my skincare. I've been going to FPC Prenatal Fitness instead of my regular Pilates place. It’s specifically for pregnant women and it's a really nice studio on Broadway. The classes are all about cardio with breathing and that's been really good for healthcare. Has pregnancy changed your personal style? “I kind of refuse to buy pregnancy clothes. I bought tights, for instance, and I can't even breathe in them, so they’re a total waste of money. My regular jeans lasted until I was five months pregnant and then I felt like I was cutting off the baby's head with the bottom of the jeans. At some point I decided to get some plain knitwear dresses from Uniqlo to combine with silk blazers or sweaters from my brand. I feel like that's all I've been wearing lately. I also have some pieces from the collection that do fit. Add some tall boots and high socks and I'm done! My personal style is very similar to what I'm already creating for my customer. I'm very linked to the product. It's sophisticated and feminine, but really useful and comfortable. It's a modern woman's wardrobe, for someone on the move. Movement is so important because I don't want to design clothes that you can only sit down in. Women are going around doing a ton of stuff during the day but you don't need to be in leggings to do so. You can wear nice clothes!